As first appeared in the April 2012 edition of the Syracuse Astronomical Society newsletter The Astronomical Chronicle (PDF). Much can be said about the old hunter Orion. To Central New York observers, it had (until very recently) been the case that Orion made his way across the Night Sky during the coldest and least hospitable (to most nighttime observers) months of the year. Conditions would keep observers in hiding from him (some of the best CNY observers I know would risk surgical strikes on the Orion Nebula with their fastest to set-up and tear-down equipment). The abbreviated winter of 2011/2012 and reasonably early start of the SAS observing season have provided us with excellent opportunities in the past few months to make Orion The Hunter now the hunted. The mid-April observing session will be the last “official” opportunity to observe Orion before he disappears behind the Western horizon until the most nocturnal of us can next see him in our Eastern sky before sunrise in late August. I then take this opportunity to discuss Orion, one many CNY/SAS members may know the best by sight but may know the least by observing attention. One of the topics covered in the 2011 SAS lecturing series was how we observe. Not the discussion of optics or the physics of planetary motion along the ecliptic, but the visual and mental mechanisms we use to translate the photonic triggers in our retina into mental pictures of celestial objects. Orion was the astronomical example I used to describe Pareidolia, how we impose a kind of order on things we see despite that order not being present in the actual collection. When you look at a cloud, you may see a face, an animal, or something your mind triggers as being something it clearly is not. 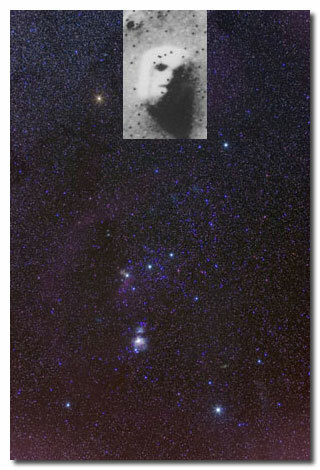 I often placed the infamous “Face On Mars” next to the Constellation Orion to show clearly how we see what we think we see despite all reasonable evidence to the contrary (or the two can be mangled together, as shown below). The clouds may look like an animal, the “Face On Mars” looks unmistakably like a shadowed face, and Orion, as it happens, has looked like a human figure to virtually all peoples for as long as we have record of Constellations, the same way Scorpius has appeared as a scorpion to every civilization for which this little monster was part of the local biosphere. … are obvious to all, while the head and club stars require a longer look to identify. Sticking to Naked Eye observing for a moment, Orion is not only famous for its historical significance and apparent brightness. 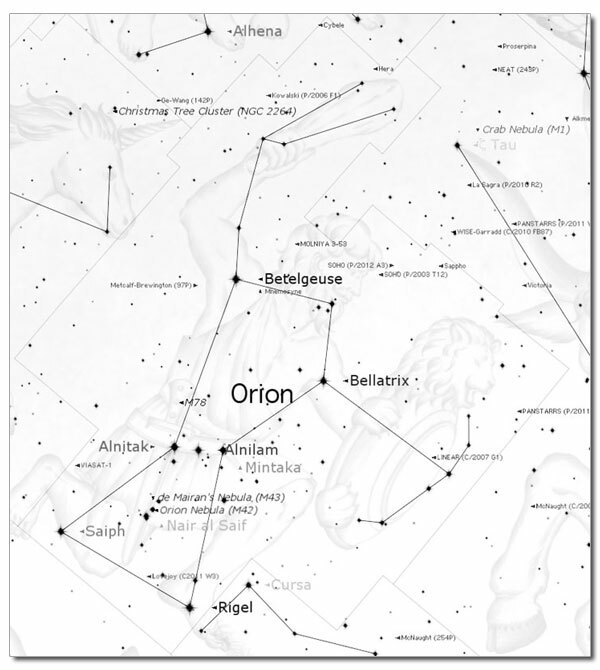 Orion is ideally oriented to serve as an order of alignment for several nearby Constellations and is surrounded by enough bright stars and significant Constellations that curiosity alone should have you familiar with this part of the sky in very short order. 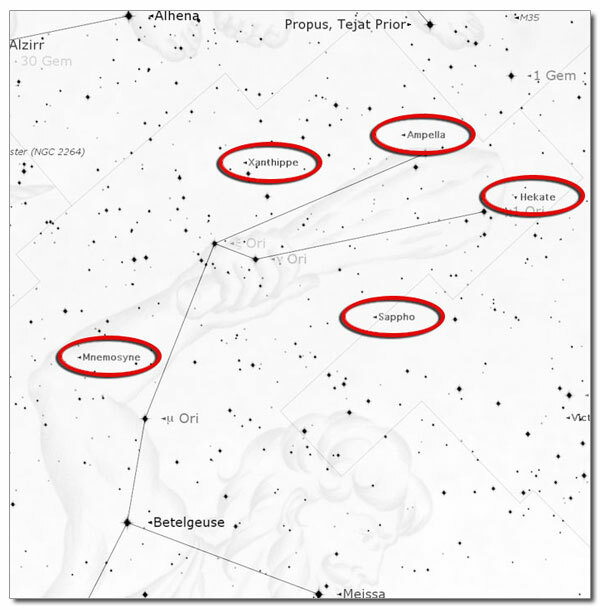 As an April focus, it is of benefit that all of the Constellations we’ll focus on either hit the horizon at the same time as Orion or they rest above him. (RED) Following the belt stars to the right will lead you to the orange-ish star Aldebaran, marking the eye of Taurus the Bull. This is a dense part of the sky, as Aldebaran marks both the head of the Bull and also marks the brightest star in the Hyades star cluster (a gravitationally-bound open cluster 150 light years away composed of over 100 stars). Just to the right of this cluster is the “Tiny Dipper” known as the Pleiades (Messier 45), another dense star cluster worth observing at all magnifications. Both of these clusters are simultaneously easier and harder to find at present, as Venus (“1”) is resting just above them, providing an easy way to find both clusters but plenty of reflected light to dull the brilliance of the two open clusters. 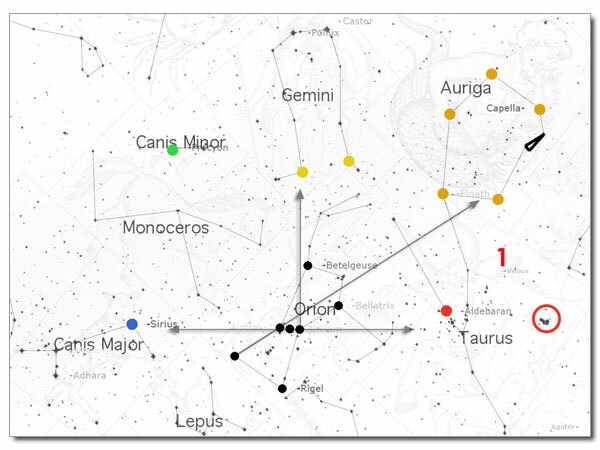 (ORANGE) Auriga, featuring Capella (the third brightest star in the Night Sky), is an oddly-shaped hexagon featuring a small triangle at one corner. Auriga, like Ursa Minor in last month’s discussion, is made easy to find by the fact that the five marked stars are in an otherwise nondescript part of the sky (relatively dim generally, but brighter than anything in the vicinity). Venus will dull Hassaleh (Auriga’s closest star to Venus and the two open clusters below it) but Elnath and Capella will be easy finds. (YELLOW) Castor and Pollux, the twins of Gemini, are literally standing on Orion’s club. Making an arrow from Mintaka (the right-most star of the belt) and Betelgeuse will lead you to Alhena (Pollux’s left foot), after which a slow curve in a horseshoe shape will give you the remaining stars. (BLUE) Canis Major is the larger of Orion’s two dogs and contains Sirius (“The Dog Star”), a star so bright (magnitude âˆ’1.46) and so close (8.6 light years) that it appears not as a star but as a shimmering light. Some would say an airplane, others would say a hovering UFO. Part of my duties as president involve intermittently explaining that it is not the latter. And, with respect, Monoceros is an old Constellation but not a particularly brilliant one. Having Canis Minor and Canis Major identified will make your identification of Monoceros quite straightforward. We now turn to the other “stellar” objects in Orion, composed of three Messiers and one famous IC. M78 is a diffuse nebula almost one belt width above and perpendicular to Alnitak. You will know it when you see it. M43 and M42 (marked as “4” in the image below), on the other hand, are so bright and close that you can see their nebulosity in dark skies without aid of any optics. M42 – The Orion Nebula is, in the right dark conditions, a Naked Eye sight in itself. For those of us between cities, even low-power binoculars bring out the wispy edges and cloudy core of this nebula. For higher-power observers, the resolving of Trapezium at M42’s core serves as one of your best tests of astronomy binoculars (I consider the identification of four stars as THE proper test of a pair of 25×100’s. Ideal conditions and a larger aperture will get you six stars total). You could spend all night just exploring the edges and depths of this nebula. You can take a look back at the Astro Bob article in the April 2012 edition of the Astronomical Chronicle (From My Driveway To Orion, Nature Works Wonders) for a more detailed discussion of this part of Orion. M43 – de Mairan’s Nebula is, truth be told, a lucky designation. M43 is, in fact, part of the M42 nebula that is itself a small part of the Orion Molecular Cloud Complex (not THAT’S a label). M43 owes its differentiation to a dark lane of dust that breaks M43 and M42, just as the lane of dust in our own Milky Way we know as the “Great Rift” splits what would otherwise be one continuous band of distant stars the same way a large rock in a stream causes the water to split in two and recombine on the other side. Finally (and the one you’ll work for), IC 434, the Horsehead Nebula, lies just to the lower-left of Alnitak (1). The Horsehead is itself a dark nebula, a region absorbing light to make it pronounced by its difference from the lighter regions around it. 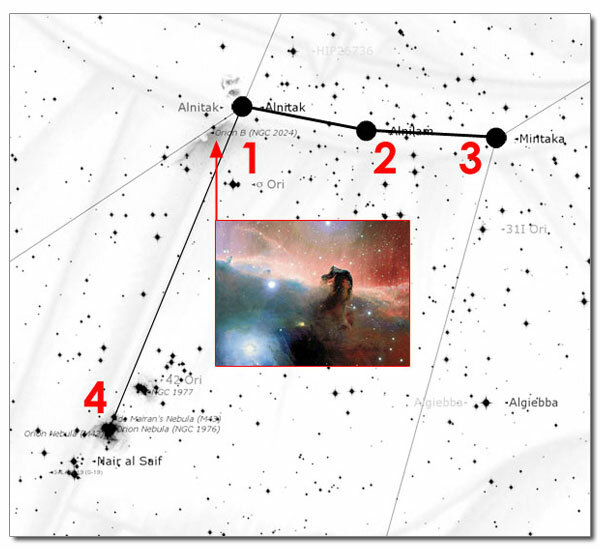 To put the whole area into perspective, The Horsehead is itself STILL within the Orion Molecular Cloud Complex. The sheath of Orion’s Sword and nearly the entire belt is contained in this Complex, like dust being rattled off with each blow from Orion’s club. I close by taking a look at the perilously ignored club attempting to tear into Taurus. At present, asteroids surround Orion’s Club like pieces of debris flying off after a hard impact. All are in the vicinity of 12th magnitude (so require a decent-sized mirror), and all are also moving at a sufficiently fast clip that their paths can be seen to change over several observing sessions (if, by miracle, enough clear days in a row can be had to make these measurements). I have highlighted the five prominent ones in the image below. Is it an oddity to have Orion so full of asteroids? Certainly not! Orion is placed near the ecliptic, the apparent path of the planets in their motion around the Sun. Orion’s club just barely grazes the ecliptic at the Gemini/Taurus border, two of the 12 Constellations of the Zodiac, the collection of Constellations that themselves mark the ecliptic. As nearly all of the objects in the Solar System lie near or within the disc of the Solar System, you expect to find all manner of smaller objects in the vicinity of the Zodiacal Constellations. In effect, Orion’s club is kicking up different dust all year long as the asteroids orbit the Sun. You only have a few more weeks to watch the action happen before Orion’s return in the very early early morning of the very late summer.